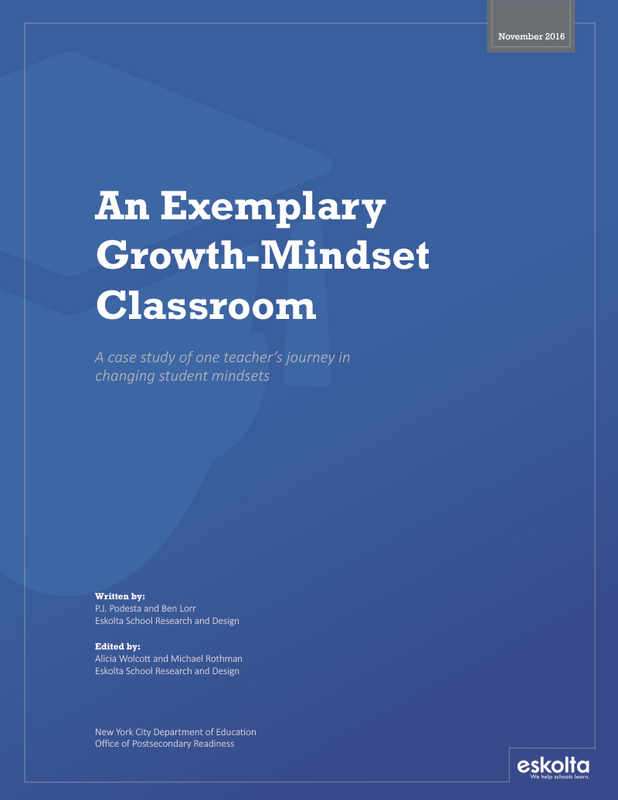 An Exemplary Growth-Mindset Classroom: A case study of one teacher’s journey in changing student mindsets, details the story of Diane Jenkins, a middle school teacher who took steps to improve her students’ growth mindset—the belief that they could become more intelligent with effort. Diane Jenkins’s story is particularly impressive. As an English teacher at I.S. 229 Roland Patterson Middle School in the West Bronx, not only did she help her students develop positive mindsets, but she also shrunk the percentage of students who felt their intelligence was unchangeable by 36 percentage points. Jenkins’s approach, which she developed as a participant in the NYC Department of Education Academic and Personal Behaviors Institute, followed and built upon the “path of change” to successfully support the development of a growth mindset for struggling students identified in a 2013­–14 study by Eskolta. First, she introduced the concept of growth mindset through direct instruction. Second, she integrated growth-mindset phrases into her everyday language. Third, she created a growth-oriented environment that encouraged students to focus on the process of learning. And fourth, she focused either on strategies for students who struggled despite putting in the effort or on value to help students see the importance of learning itself. This case study details the steps that Jenkins took to help her students develop a growth mindset. Resources include a lesson plan for introducing the concept through readings and videos about the science as well as ideas for inspirational “hooks,” such as celebrities’ stories about the effort they put in to achieve success; structures for holding discussions that orient students to skills and strategies; and methods for providing specialized support to students who still struggle despite putting in effort.